After stints at the helm of Straw Hat Pizza and then Rita’s Italian Ice, Jonathan Fornaci, a fitness fanatic, took a job franchising a business that subtracts rather than adds to its customers’ calorie counts. We asked him to tell us his tips for building a successful franchise business, but the story of his latest venture captures them all. On a visit to Las Vegas two years ago, Fornaci dropped in for a workout at TruFusion and was wowed. “I had never experienced anything like it in my life,” he says. 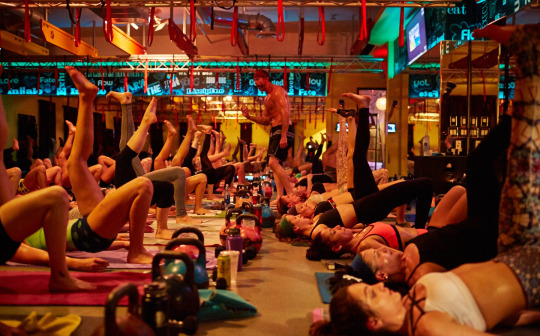 The 10,000 square foot facility offered 230 classes in 65 workout genres per week, including aerial fitness, barre, boxing, crossfit, kettlebell, pilates, spin, and 16 forms of yoga. Between 800 and 1,000 members showed up every day. Early last year, the two-year-old Vegas club hired Fornaci to move there and help it start franchising. He spent 6 months and $2 million building a team, including 50 employees dedicated to franchise support, and investing in technology to replicate the TrueFusion formula. Since then, business has been “going gangbusters,” he says–TruFusion made 30 percent net income and sold 56 franchises in a year. The first few new facilities, “even bigger and more grandiose than the original,” all with customized HVAC systems that pump extra oxygen into classrooms and building materials that can withstand the humidity, will open in July, August, and September elsewhere in Vegas and in California, he says. Clubs in Colorado, Oregon, Washington, New York, and Miami are also on the drawing board. Based on current membership stats, Fornaci says TruFusion appeals most to the health- and eco-conscious millennial woman who prefers social workouts choreographed to loud music over quiet, solo exercise. There’s no weight room, no treadmills, no independent training space. It’s all about group fitness. Fornaci describes the locker rooms as “beautiful and spa-like,” cleaned with tea tree oils instead of bleach, and stocked with organic shampoos and conditioners. At the snack bar, smoothies are also organic and 60 percent of food offerings are vegan. Ancillary services include cryotherapy, IV therapy, hair blowouts, massage, tanning, meditation, nutrition coaching, daycare, and a retail shop. And, at least compared to what someone like Fornaci has paid to take multiple styles of group classes, fees are reasonable: A one-month membership for access to unlimited classes at the Vegas branch costs $99. In California, he says, rates will be slightly higher. But unlike the typical gym that has a 40-50 percent annual turnover rate and members who show up once a week, Fornaci says TruFusion members come four times a week and are loyal; even after doubling its fees, turnovers didn’t exceed 20 percent. For instance, he’s leveraging technology to ensure that classes at each TruFusion location have the same level of intensity and quality. “Every one of our classrooms has a camera and microphone installed.” That’s so lead instructors at headquarters can review video of every class and send critiques and footage of mistakes to each franchise’s instructors. “It allows instructors to make sure they’re on point and doing it the right way,” Fornaci says. Via a secure web-based portal, franchise managers will also be able to access company materials, operations manuals, and anything else they need to run their facilities and replicate the successful formula of the original club. “You don’t want to be a new franchisee asking questions and not knowing answers,“ he says. "We invested the money in systems and training and hired really experienced franchise people … to be able to deliver a turnkey solution,” Fornaci says. That, he says, is what it takes to create a winning network of franchises.